Seriously, she's become a little obsessed. 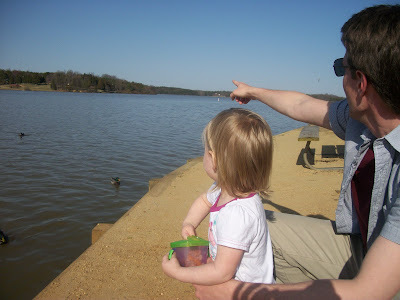 We visited the park by the lake that's close to our house one day last week. She likes watching the ducks so much, she doesn't really care about the playground with the kids and the swings - which normally would command her attention. 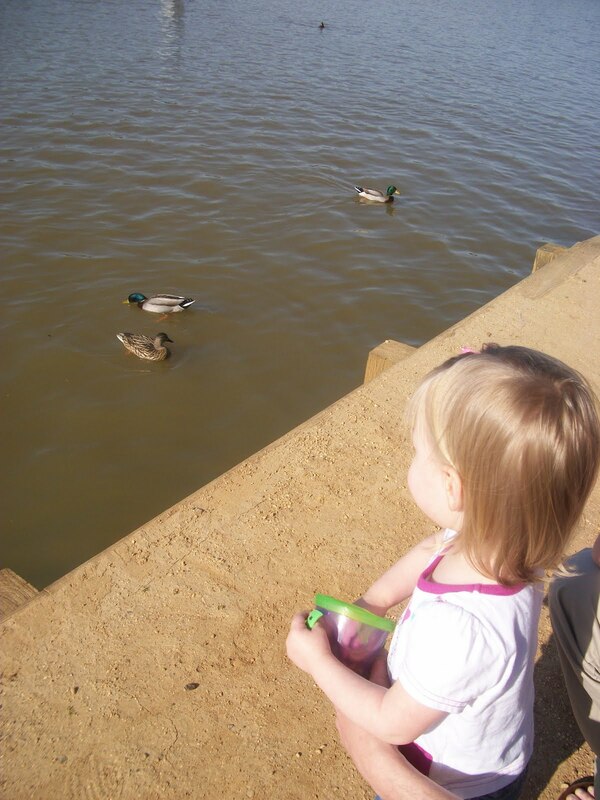 It looks like she's feeding the ducks, but she's not. She's just eating her snack while we watch them swim. The city has very strict rules about not feeding the wildlife. There's a little retention pond in our neighborhood that we've been visiting too. There's some ducks there, but mainly geese. They honk very loudly whenever we visit because there is a mama goose sitting on some eggs by the edge of the pond. So, Cadie calls them the honk-honks, and she really likes to talk about them whenever we are outside. Our little outside girl!! WE are so happy that she enjoys the ducks and geese so much. She talked about them allot when I was there too. She is so darling. We love our little nature loving girl. I see more "Duck" books in her future!